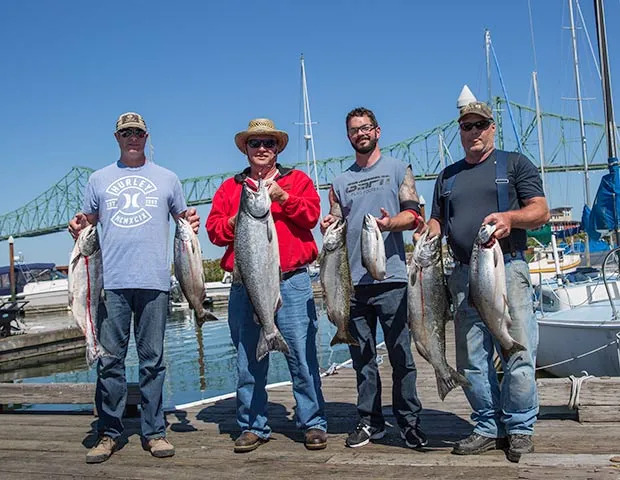 Lance Fisher Fishing is a fishing guide and fishing charter service in Astoria, Oregon. Astoria is one of the great fishing towns in the world and why wouldn’t it be? Astoria sits on the south shore of the Columbia River, 10 miles from the Columbia River Entrance where it joins the Pacific Ocean. The estuary environment as it joins the Pacific is an amazing ecosystem and rendezvous area for many species of sport fish (Salmon, Steelhead and Sturgeon), bait fish, crab and wildlife. Astoria is home to Buoy 10 Salmon fishing, the Columbia River, Pacific Ocean, 3 runs of Salmon, Steelhead and a world-class sturgeon fishery. For me as a fishing guide and fishing charter operator, the fishing opportunities are amazing and I’m always excited to share such a special place with my customers. My first time salmon fishing and it was a complete success. Lance handled everything wonderfully from baiting our hooks, how to get bait properly in the water (who knew there was a technique! ), to depth to set our reels at. Lance is so easy going, fun to be around and made fishing fun and informative. His boat is beautiful, he keeps things clean and tidy and when it came time to land a fish, he gave us clear directions and made sure that our entire crew had an absolute ball. Thanks Lance for the great day in Astoria!! My wife (Kathy) and I fished Buoy 10 with Lance Fisher few days ago. Had a great time out on the water. We lost a lot of fish, but we also boasted our fish too. We also spotted a whale and porpoise. Lots of laughs and jokes. Although we have been out with Lance before, I wouldn’t just call him a great guide and fishermen, he also good friend and family man. I would recommend him to all my friends and whoever need a great guide with personality to fish. He will put you on them. Thanks Lance for a great time. We had three generations of the family out for a wonderful day of fishing the Astoria area. We caught lots of fish and Lance was very instructive and great with all of us, young and not as young alike. This was my second year out & I look forward to booking next year’s trip. Buoy 10 may be the biggest fishery on the continent. Approximately 30,000 Salmon are harvest during this fishery that spans from August 1. into October. Run sizes vary by the year, but typically over a million Salmon (Coho and Chinook) enter the river during this time period in three distinct runs. Guided fishing charters are very popular during this time and it’s important to book early in order to have the greatest selection of open dates. Buoy 10 Chinook Salmon begin arriving in early August and will remain, depending on the tides, into the middle of September. 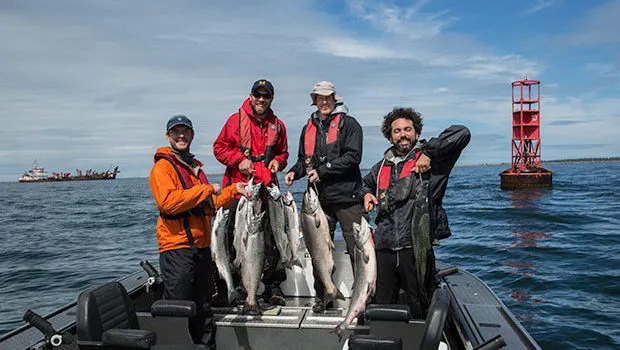 The Coho A run arrives around the third week of August and will remain on good years until the third week of September. About this time a B run of Coho Salmon will make their way into the Columbia River and that run, when numbers are good will last until the middle of October. Here’s more information on Buoy 10 Salmon Fishing in Astoria. Before the Columbia River see its big push of Salmon, the Pacific Ocean in front of the Columbia River has long been producing Salmon. Fishing gets going about the 1st of July and remains an option through August. The fish we catch in the ocean are an incredible quality fish that we often times eat as sashimi at home. Coho/Silvers can be found just about anywhere in the ocean, but regularly we will find them from the Green Line south to Tillamook Head. This section of ocean is teeming with anchovies and the NW winds tend to push all the bait into this makeshift cove that is created by Tillamook Head. Coho tend to work the upper 30 feet of the water column and as a result are very easy for us to target. Coho are super aggressive and you will regularly see full size coho chasing down baits right at the surface! While we can catch Chinooks anywhere in the Pacific Ocean in front of the Columbia River, the area to the North gets a lot of our attention. From the light house at Cape Disappointment north to Long Beach, we will find Chinook feeding off the surf lines. This can be super unique fishing as we often catch these fish in 20 feet of water. These fish are feeding and are great biters. Every year is different, but there are years that we never leave this area as the fishing can be so exceptional. One of the most unique, powerful and fun fish that you will find. The Columbia River Sturgeon in Astoria are an amazing fish. Sturgeon in the Astoria area are different than their brethren elsewhere as most are migratory ocean fish. Astoria area sturgeon come into the Columbia River chasing the billions of anchovies that find themselves in the Columbia River Estuary. It is not uncommon for us to catch 60 fish in a day with 10-20 of these fish between 60-120 pounds. World-class fishing by every definition. There are lots of places to stay in the area. Preference certainly depends on your comfort requirements and budget. And while I don’t want to presume anything for my guest, I thought it would be helpful if I compiled a list of options from my experience and the perspective of someone fishing the area with me. Here’s a good list of Astoria hotels and places to stay. As far as small fishing towns, Astoria has a great little food scene. From fine dining to holes in walls, Astoria and the surrounding area offers a little of everything. For more on the subject, check out my list of Astoria restaurants that I’m familiar with. While the fishing is super cool, you could find yourself with time to visit some of the tourist attractions in the area. You could spend a solid day just looking around at the various museums, parks and other historical attractions. Here’s some suggestions of places to visit while you’re in Astoria. Difference between a “big boat fishing charter” and the 6-pack boats at Lance Fisher Fishing? At Lance Fisher Fishing we run small private fishing charters. While our boats are licensed and built to fish up to 6 people at a time, I personally prefer to only fish 4 clients at a time, but do fish 6 clients upon request. For larger groups, we simply use multiple boats. Big boat fishing charters could have as many as 40 people on a fishing trip. In my opinion a good fishing trip allows for lots of room to move around and a boat that can navigate the area around Astoria quickly. Did you know that we often travel 20-30 miles per day? Many of the big boat charters only travel 10-15 miles per hour where as our boats will travel up to 40 miles per hour. Furthermore, when we find fish, we often are moved off the fish by the tides causing us to run back up above where we’re fishing and then come through the area again. When fishing for Salmon in the Columbia River, we may make these mile long passes and subsequent moves to get up ahead of the fish up to 20 times in a day. While our 6-pack boats do this very easily, you will rarely see a big boat fishing charter use such a technique. It takes too long for boats like this to make these sort of moves and they burn too much fuel while doing it. You will pay less for the big boat fishing charters, but you will also get less of many of the things that will make your day on the water special. I’m looking for a fishing charter and I’m just a single person. Can I still book a fishing charter? Of course! Singles and small groups are simply paired up with other fishermen and women. It’s no problem and we do it all the time. Groups of 2-3 can even reserve the boat for a private trip. Just let us know what you’d like and we will try to make it happen. Tides- Why do they matter? Tides are a big deal for all bodies of water where there is tidal influence and Buoy 10 is no different. 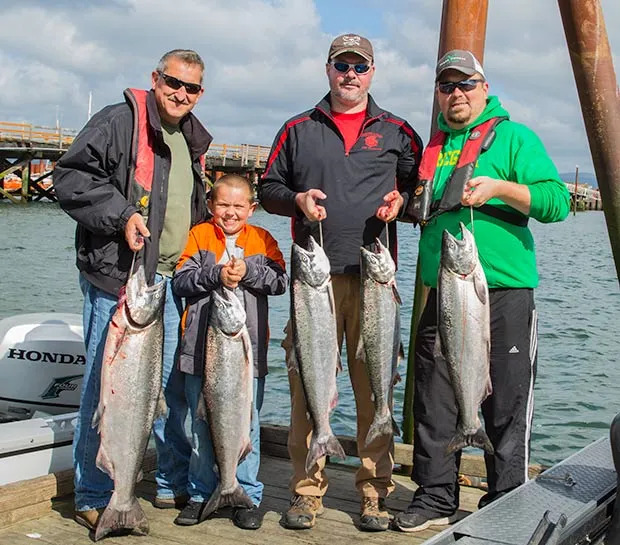 Most Chinook Salmon guides and charter captains prefer smaller tidal exchanges. The exchange being the difference between high and low tide sub 6 feet is about right for a good long Chinook bite. We can limit out on the bigger swings, but the window in the exchange to get those fish is smaller. For whatever reason, the Coho or Silver Salmon fishing is better on the bigger tides. My guess is that Coho simply like a faster moving bait and that is the result of the bigger tides where our speed over ground can reach 5 mph. For sturgeon fishing, moving water is the key. The more the water moves, more the fish get moved around. 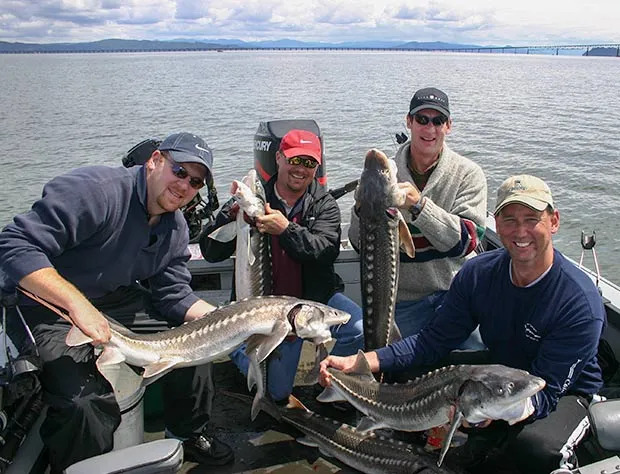 While moving water is preferred, shear numbers of sturgeon make them easier to catch than ever and even small exchanges produce in the Astoria area. What should you wear when fishing in Astoria? Astoria has it’s own unique weather environment. The combination of the warm waters of the Columbia River and the cooler waters of the Pacific Ocean can make for some pretty weird weather. While it may be a beautiful 75 degree day, it could be 57 and drizzle. You wouldn’t have any indication of such by where you may be staying in Portland, or further south on the coast. Furthermore, there are times when we will take on spray as we are traveling. This occurs with an afternoon NW wind and at times there’s no way around it. It’s a REALLY good idea to have rain gear on board. I fish in shorts and a t shirt and always have a sweatshirt for the morning. I simply put my rain gear over my shorts and t shirt and am able to quickly slip it off should it decide to get nice. There is plenty of storage room in my boat so bringing a bag with your layers is no problem. Do you moor your boat or move your launch locations? This is a question that I’m regularly asked and the answer is both! While there are times when I like to keep my boat in one place, there are other times where I might pull the boat out and launch it from a different location in the Astoria area. Why? Mostly because there are times when I’m considering the end of the day more than the beginning of the day. It means that I’m looking to be closer to the ramp in the afternoon and that might mean running a little further in the morning. I know that the tide will have me fishing in a completely different location by days end. The winds can come up in the afternoon and because of this, I’d rather be closer to the dock than need to travel a long distance through the chop. We will be flying home. How can we get our fish home? We get this question a lot. Enough to make a page to give you all sorts of information about how to get your fish home with the airlines. Fishing Licenses- What license and tags do I need? Where do I get them? Everyone who fishes must have a fishing license, tag and Columbia Basin Endorsement. This can be obtained with an annual license or with a day license. You must specify that you want the Columbia Basin Endorsement with your purchase. Children’s licenses are free, but they still must have one along with their tags and CBE. Washington licenses, tags and CBE’s are good even when launching out of Astoria when fishing the Columbia River. You must have your Washington Ocean endorsement in the event that we will fish the ocean. Oregon license holders don’t need such an endorsement. Be sure to have your license purchased before your trip. Some of the locations that we launch at do not have a place to buy your license. If you’d prefer to purchase online, you can visit the ODFW site and print your license, tag and CBE at the time of purchase. What makes a good fishing guide? A good fishing guide is of course an excellent fisherman, but at Lance Fisher Fishing, there’s a lot more to being a good guide besides just being a good fisherman. A good fishing guide is also patient, professional with their words and demeanor and kind in all circumstances. While a good fishing guide always is looking to maximize the day’s catch, a good guide will never blame a client for loosing a fish. Fish sometimes fall off the hooks, that’s just fishing. When you show up to our boats, you can expect the boat to be clean and the equipment to be high end and in excellent working order. Being a good guide is hard work and it takes a hard working individual to be able to put all of this together. For more information on any of our fishing trips, don’t hesitate to call 503.448.5988 or contact us. I’m here to help and make your fishing trip to Astoria as seamless and enjoyable as possible. Are you interested other fishing possibilities? Visit our location in Portland, Oregon. You can also see our fishing trips throughout Oregon and Washington.